Whether you’re new to WiFi marketing, or you’re a seasoned veteran, successful campaigns ultimately come down to having the right data to make informed marketing decisions. By building customer profiles, you can target specific messages to specific customer segments based on their demographic and behavior data. Customer acquisition metrics include a very accurate measurement of first-time customer visits. This can be valuable when measuring overall customer acquisition and ROI on customer acquisition marketing campaigns. Bloom’s customer profiles always include the customer’s first visit data and time. This allows you to see how long a customer has been frequenting your establishment. 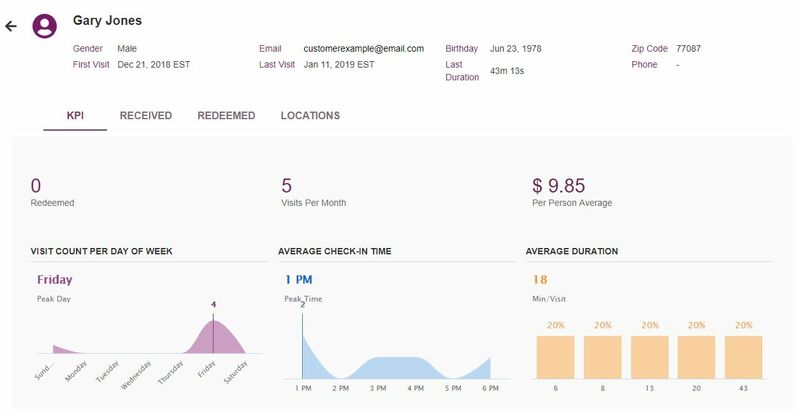 Customer engagement metrics include things like customer visit repeat rates, dwell times, visit days and times, and locations visited (for multi-unit chains). These metrics allow you to measure increases in customer visit frequency and spend, as well as customer behavior. Bloom includes all of these metrics in each customer profile. 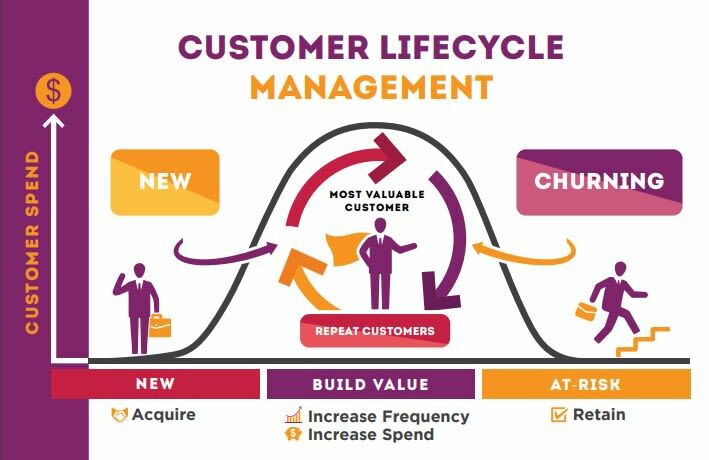 Customer retention metrics include data such as customer repeat rates, churn rates, churn potential, and projected customer lifetimes. These metrics will help you identify and target loyal customers, as well as those who are at risk of churning. They are found in all Bloom customer profiles. By understanding and using these metrics effectively, you’ll have the data you need to help you develop marketing campaigns for every step of your customer journey, from attraction and acquisition, through building customer value, to retaining your best customers indefinitely. Bloom Intelligence collects this data for you and presents it in an easy-to-understand graphical interface. You’ll also have a sortable list of detailed customer profiles. This allows you to segment your customers based upon their demographic and behavior data, and then create marketing campaigns that are targeted to that specific segment of customers. CMO.com has reported that targeted marketing can be twice as effective as non-targeted advertising. With Bloom Intelligence, you will have the data you need to segment and effectively target your ideal customer groups. Let’s take a look at a few customer profile examples. In this customer profile example, we can see that this is a 40-year-old male who has visited our establishment 5 times in the past. He typically comes in on Fridays during the afternoon but only stays an average of 18 minutes. He is a relatively new customer who lives in southeast Houston, Texas. We can also see that his PPA is less than $10. A quick look at the locations tab and you can see that he has only visited one of your locations. In this case, you would like to increase his average visit time, introduce him to your dinner menu, and increase his per-person average. Knowing what you can gather from his profile, and that longer visit times will typically increase PPA, you can create an email message letting him know that you appreciate his business and that you’d like him to try out your dinner menu. You include a link to your menu on your website and include a coupon for a free appetizer with any dinner order. With Bloom, you will be able to see if he received and opened the email. And you’ll see exactly when and where he redeems your coupon. If this customer does engage with your message and redeems your coupon, you can send the same type of message to other customers who match his profile. In this customer profile example, we see a 29-year-old female who began visiting your store over a year ago. She has visited a total of 4 times, with several months passing between visits. She typically comes in during dinner hours and stays for about an hour. While this customer profile example represents a good patron in terms of per-person average and behavior at your store, you’d like to have her visit much more often. There are several things you can try to get her in your store more often. For instance, you could offer discounts or promote special nighttime events. However, you decide to create an email message thanking her for her patronage and loyalty, and then inform her that you will give her a special discount on every 5th visit, including her next visit. 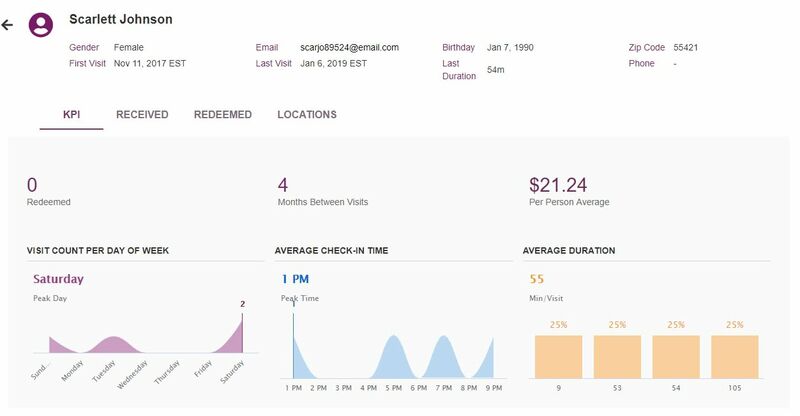 With Bloom’s automated marketing suite of tools, it is very easy to configure an automated message when a customer reaches a predefined number of visits. This message will have a redeemable coupon embedded within it. Again, with Bloom’s ability to track ROI on ever campaign, you’ll be able to easily see how well your strategy is working. These customer profile examples should give you a strong foundation on how and why you should start building customer profiles. Bloom Intelligence creates customer profiles and builds upon the data every time someone walks into your location and or logs into your WiFi. With the kind of data collected, you can see from the customer profile examples above that there are countless marketing strategies you can execute to personalize your customers experience which ultimately builds customer loyalty. With the power that customer profiles can deliver, you will obviously want to collect as many as you can. Fortunately, there are some tactics that will help you grow your profile list faster. If customers don’t know you offer free WiFi, they won’t log in. Many restaurateurs will display signage in prominent places letting customers know about their WiFi and encouraging them to log in. Some will even offer an immediate incentive for customer to log in, such as a free dessert or appetizer. You can also make regular changes to the specials advertised on your login page. Bloom Intelligence will make those changes for you anytime at no additional cost. Bloom also incorporates progressive profiling. This means that every time a customer comes back and logs into your WiFi, instead asking for their email address, Bloom will analyze their customer profile and ask for any missing pieces of information. This will ensure the most complete and accurate profiles, allowing you to better segment, market to, and engage your customers. With the WiFi marketing and analytics tools from Bloom Intelligence, physical locations can gather accurate, real time data on their actual customer base. This means you no longer have to make assumptions about your customers and how to engage them. Now you can build and execute marketing campaigns that you can measure precisely. As a result, you’ll be able to create robust and profitable marketing endeavors to grow your business. You’ll be able to accurately measure results and duplicate your successful campaigns. And if they do not perform as well as you expect, you can easily adjust your tactics and watch the results. To see even more ways to use the data provided to you by Bloom Intelligence, download The Value of Customer Profiles below.